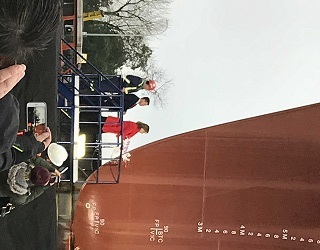 Vancouver, BC – Members of IAM Local Lodge 692 proudly watched the launch of the first ship built under Canada’s new national shipbuilding strategy – the Sir John Franklin. 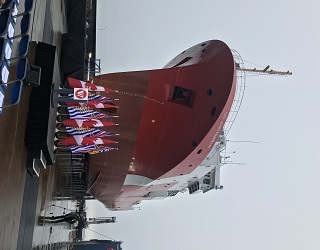 The 64.3 metre vessel, designed and built at the Seaspan Shipyards in North Vancouver, is the first of three to be built for the Canadian Coastguard under the national strategy. “Our members are extremely proud of their contribution to this ship, the first of three research ships to be built here, construction on the other two is currently underway,” explained IAM District 250 Directing Business Representative Walter Gerlach. The members include mechanics responsible for fitting the machinery in the ships, machine shop personnel and heavy duty maintenance mechanics. The 3,200 ton Franklin, is named after the 19th century British Royal Navy officer who perished with a crew of 128 in search of the Northwest Passage. It will be used by the Canadian Coast Guard to research the health of fish stocks and their ocean environment. 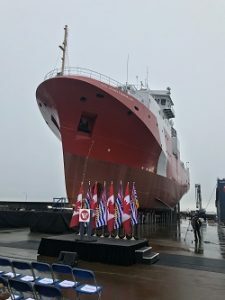 In addition to the Franklin and her two sister ships, Seaspan will construct over the next 10 -15 years, up to 14 additional non-combatant ships including a 4,500 ton offshore oceanographic science research vessel, two 20,000 ton joint support ships for the Royal Canadian Navy, one 23,000 ton polar ice breaker and ten offshore medium endurance patrol vessels. The multi-billion federal strategy covers a 30-year period.